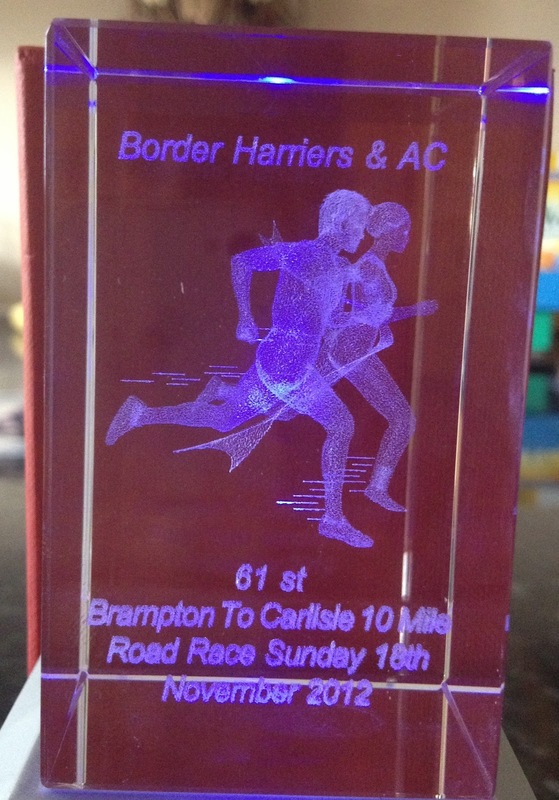 On Sunday the 18th November 2012 I ran the Brampton to Carlisle 10 mile run. This is the longest 10 mile run in the UK – well obviously its 10 miles in length but what I mean is it’s the longest running! This year was the 61st year of the run (which apparently incorporates the North of England Championships). 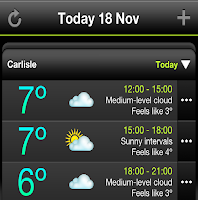 The very wrong weather forecast! After a surprisingly good night’s sleep, (I had gone to bed feeling crap with a really bad head ache), I got up early and fueled up with porridge. I was feeling more and more apprehensive about the race! Long leggings, short leggings, short sleeve t shirt, long sleeve t shirt, gloves, no gloves, which trainers... so many decisions to be made!!! 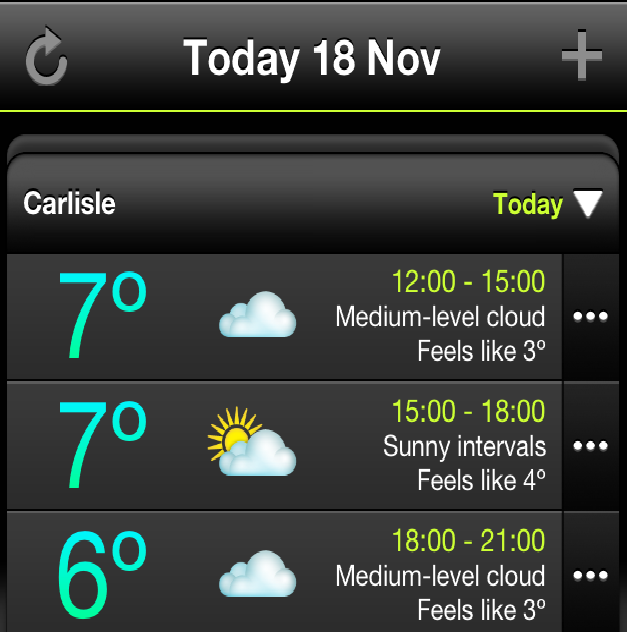 I looked at the weather forecast and made a decision based on the fact it was going to be a fine dry day! I opted for three quarter leggings, t shirt and gloves! The closer we got to Carlisle, the more apprehensive I became. I never enjoy the start of races and I felt ill prepared after some disappointing training runs since running Chester Marathon, and I had visions of everyone (except me!) being ultra elite and competing for the North of England championships! I think my legs had gone on strike for a period of time! We arrived at William Howard School in Brampton at around 11am for the 11.30am start! I collected my running number (no queue) and then headed to the toilets (huge queue). Luckily as I was heading to the loo queue a girl exited from a well hidden disabled toilet! I took her lead and went in! I must have been spied by some ladies in the long queue as when I came out there was a long queue for this one too! For once I had beaten the system! I headed to the start line. There was no fancy dress, just Lycra deep heat and some very serious warm up’s which made me smile! Should I be participating in such weird rituals! Perhaps this is where I am going wrong – If I could get my legs into the positions these “elite” runners were getting their legs perhaps I would be a faster runner! The race literally started with a bang, when a real starting pistol was fired and a surprising “ooh!” from the crowd before we all set off in a bobbing mass of fluorescent colour. I was disappointed to learn that this wasn't a chipped race and the time would go on the gun time. The first section through Brampton was crowded and many runners were jostling for position. I found it difficult to turn right, there was a bottle neck with cars and many other runners barring my way! However, once on the open road the running field spread out a bit and the mile signs seemed to pass by quickly! We came to the first hill (and the only substantial one) at around mile 2 just as it started to rain (weather man got it wrong!). As I reached the top of the hill the rain had turned to hail and was met with groans from the runners around me!!! I felt this was going to be a déjà vu run from last week’s training run! Luckily the hail and rain soon passed and we were left with just a cloudy day! I was surprised how many cars were trying to pass through the runners – surely with the number of runners in the race the roads should have been closed. Luckily the runners were in the majority and in such a mass the cars had no choice but to pull over and wait! At around mile 4 there was a water station with bottled water. I grabbed one and set off in my pace again. By now I had latched on to following a couple who appeared to be running at my pace, it kept me motivated to keep them in my sights! 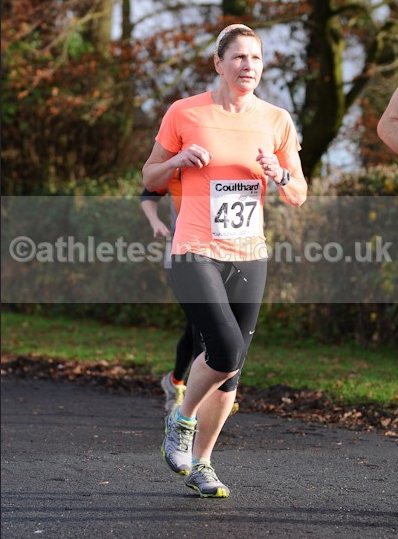 With one eye on my Garmin I was delighted to see I was keeping to 8-something minute miles! I have struggled to keep to 9 something minute miles in recent weeks. The route passed fields full of sheep and cows before joining a fairly busy main road. Another water station at mile 7 kept me hydrated and ready to rumble! I still had my “pacers” in sight and was feeling fairly confident with plenty of energy! There were very few spectators on route and those who did come out didn’t do a very good job of clapping and encouraging us! I got a surprise to see my Mother-in-law on route, she lives close by and decided to come and cheer me on! A hill appeared at mile 8 and my “pacers” slowed – I overtook them and expected to see them in front of me again once at the top but I managed to retain my pace! 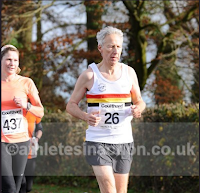 The last half mile was downhill – I tried to pick up the pace and although I felt like I was going like the wind, my Garmin stats tell me ...I wasn’t! There was a sharp left turn just before the finish line which I had to negotiate; I had no idea where the finish was! Once finished I was handed a little red box which was surprisingly heavy. I opened it with trepidation expecting to see huge bling (being heavy!) and was delighted to see instead a glass engraved paper weight type momentum – better than a T shirt and a first for me! There was a water station at the finish, but this time they were just handing out warm cups of water, no bottles and no food! Although I was chuffed to bits with my momentum I was slightly disappointed not to get the usual goody bag with a cereal bar or banana in to keep me going! As I said this was not a chipped event so my time from the gun firing was 1 hour, 26 minutes, 24 seconds. My Garmin said 1 hour 24 minutes – wish it had been chipped to get an accurate time! However, I was still pleased with this time – I wanted a sub 1 hour 30 and I got it whichever time I go with! You can view my run here!